Paul Murphy arriving at the Central Criminal Court of Justice in Dublin last week. THE JURY IN the trial of six men accused of falsely imprisoning former Tánaiste Joan Burton will continue deliberations tomorrow. The jury of seven men and four women deliberated for a total of one hour and 53 minutes in the Dublin Circuit Criminal Court trial today without reaching any verdict. Judge Melanie Greally sent the jurors home for the evening. She issued the usual warnings including that they should not discuss the case outside the jury room. “It is very very important that you confine your discussions of the case to your jury room even when you’re with other jury members,” she said. 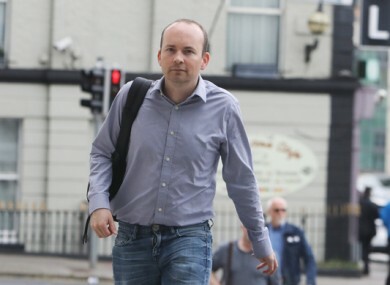 Solidarity TD Paul Murphy and five other men have pleaded not guilty to falsely imprisoning Burton and her adviser Karen O’Connell by restricting their personal liberty without consent at Fortunestown Road, Jobstown, Tallaght on 15 November, 2014. The trial started on 26 April. The two women were attending a graduation ceremony at An Cosán adult education centre when demonstrations broke out around them. They remained in a car in the churchyard and then in a jeep on Fortunestown Road for a total of three hours after they were surrounded by protesters. The prosecution alleges that by surrounding the cars, the accused men engaged in a joint enterprise to “totally restrain” the women and deprive them of their liberty. The defence has submitted that there was no false imprisonment and that the accused men were exercising their constitutional right of peaceful assembly. They maintain that obstructing the car was no more than “an inconvenience, delay and a nuisance”. Outlining a number of points, Judge Greally told the jury that if they were not satisfied the women were totally restrained in the Avensis car in the churchyard, then “the prosecution case has fallen at the first hurdle”. Judge Greally told the jury they should also regard the video footage from that day as the “primary and most reliable evidence”. She said video footage at times contradicted the witness testimony in the case and that the video footage was independent and not subjected to the “frailties of human memory”. She said they should not draw any adverse inference from the fact that none of the accused men gave evidence at trial. She said the defence case for Paul Murphy was that he took “positive steps to end the women’s restraint”. She said the defence maintains that is inconsistent with Paul Murphy’s intent to falsely imprison the women and inconsistent with his guilt. Similarly, the judge said Michael Murphy’s defence submits he was promoting peaceful behaviour on the day and made attempts to support Burton and O’Connell leaving Fortunestown Road. Judge Greally told the jury that Paul Murphy’s counsel also maintain that it was poor policing and bad decision-making on the part of the senior inspector at the scene that led to the women being held in the first car in the churchyard. In her charge on Monday, Judge Greally told the jury that if they decided the protest was peaceful, they must consider the actions of the gardaí that day, including whether the protest was mishandled from the start, if gardaí failed to prepare, if the decision to move the women from the church was the wrong decision, if they ended up being left longer in the cars than they should have been and whether gardaí should have engaged with protesters. Today, the judge said they must consider the actions of gardaí that day even if they decided the protest was violent. The trial heard that there was a “lack of statements” taken from people who were present at the protest that day. The judge said the absence of these statements may be relevant to “the suggestion that has been made that gardaí had an agenda in relation to the accused and in particular Paul Murphy”. In her initial charge, Judge Greally said the jury must consider whether Burton and O’Connell had a means of escape. She said two such possible means of escape had been raised at trial – that they get out of the car and leave Fortunestown Road on foot, or that the Jeep reverse as advised by the Garda Air Support Unit. Today, the judge said a third means of escape was open to the jury to consider – whether the women could have “egressed down Fortunestown Road”. She said that means of escape involved “commotion and chaos” but it was open to the jury to decide if it was a reasonable option. She also said Scott Masterson’s defence maintains that his actions on the day, including asking Joan Burton to get out of the car and “answer us” were inconsistent with his intent to carry out false imprisonment. The jury resumed deliberations at 12.43pm. At 1.10pm Judge Greally called the jurors back and sent them out to lunch, telling them to stop deliberations over lunch and to use the time to “relax and switch off”. The men on trial are Paul Murphy (34) of Kingswood Heights, Tallaght; Kieran Mahon (39) of Bolbrook Grove, Tallaght; Michael Murphy (53) of Whitechurch Way, Ballyboden, Dublin; Michael Banks (46) of Brookview Green; Scott Masterson (34) of Carrigmore Drive, Tallaght and Frank Donaghy (71) of Alpine Rise, Tallaght. Email “If Jobstown jury not satisfied Burton was totally restrained in car, 'case has fallen at first hurdle'”. Feedback on “If Jobstown jury not satisfied Burton was totally restrained in car, 'case has fallen at first hurdle'”.